Thank You For Making Streets Happen! I know its been a while since you’ve heard from us here at IMAN. As we close the books on ‘Takin’ It to the Streets’, we wanted to thank you for making ‘Takin’ It to The Streets: Urban International Festival’ a resounding success! Despite the forceful rain and winds of Friday’s thunderstorms, The Most High offered the people of Chicago a glorious rain-free Saturday. There’s no doubt that Takin’ It to the Streets drew one of the most diverse audiences ever seen on the lawns of Marquette Park or for any free festival on Chicago’s South Side. The festival is now the largest Muslim-led free community festival of its kind in the country. Thanks to your support and the generous support of our key sponsors (click here to see the list), we all made IT happen. Takin it to the Streets once again demonstrated the powerful ability to unite people across racial, religious, ethnic and socio-economic lines. Along with renowned national and international artists like Mos Def, Brother Ali, and Tinarawen, this year we were also joined by many prominent activists, politicians and religious scholars. Mayor Richard Daley, Imam Zaid Shakir, Reverend Jesse Jackson, Congressman Keith Ellison, and Rashad Hussein were only a few among many of the distinguished leaders who spoke at or visited the festival. Click here to view published articles, t.v and radio segments from local and national media outlets. 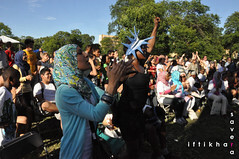 IMAN leaders, organizers and volunteers proved that the Muslim community can convene up to 20,000 people in one space on Chicago’s South Side without any incident of violence. The prevailing perspective of the police department and many who attended the event was that Streets was one of the most peaceful and incident-free gatherings of that many people in Marquette Park’s history. In order to ensure the success of future Streets, we need your feedback. As a participant, you saw Streets from a unique perspective and we want to know what the quality of your experience was and how we can work to make future festivals even better than this year’s. Please take 5 minutes to complete the ‘Takin’ It to the Streets’ Survey. Thank you again for your continued support, prayers and energy. 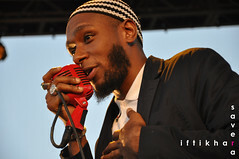 This entry was posted in Arts & Culture, News and tagged International Festival, Marquette Park, Mos Def, Muslim Art, Muslim Festival, Volunteer by IMAN Staff. Bookmark the permalink. One Response to Thank You For Making Streets Happen!